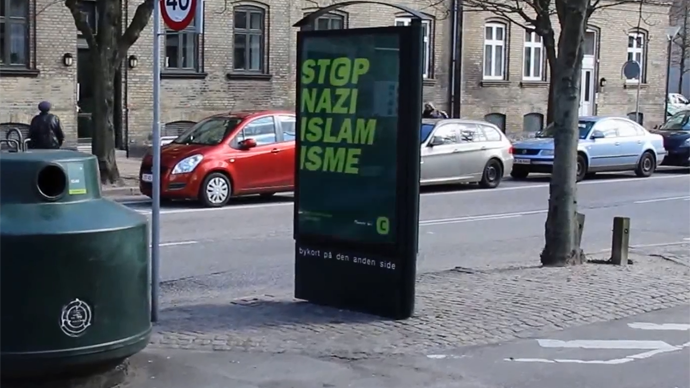 A controversial political campaign has recently been launched by the Conservative party in Denmark, with its leaders calling for radical Islam to be “fought and eliminated,” as it belongs to the same family as, and shares many ideas with Nazism. Brand new political slogans and posters have started to appear in the country despite it not currently being in the throes of an election. The most controversial ones are those of the Conservative party. Its leaders Søren Pape Poulsen and former MP Naser Khader have published an opinion piece in Århus Stiftstidende newspaper, saying that “Nazi Islamism” must be “fought and eliminated”. The politicians acknowledged that the 1.5-billion-strong religion is predominantly peaceful, but insisted that “there has developed a dangerous political ideology – we would almost call it a cancerous tumor – that unfortunately is dominating more and more”. While the Danish election campaign has not yet been officially initiated, these kind of statements are “a kind of an election campaign everyone can see,” Fatih Alev, chairman of the Danish Islamic center, told RT. “It is going to be about immigration and Muslims, I have no doubt about that. And it is something that influences many Muslims, young Muslims here in Denmark in a negative way,” Alev says. Making up 4.8 percent of the population, Islam is the largest minority religion in the Scandinavian country of over 5.6 million people. With anti-Islamization movements gathering thousands of new supporters across the continent, European Muslims have felt intensifying anti-Islamic moods in society. The EU countries have seen a massive public backlash against Islamic radicalism following the January attacks in Paris, that left 17 people killed. Back in February, one civilian was killed and three police officers were injured at a cafe in Copenhagen during a free speech discussion, which was attended by controversial artist Lars Vilks and the French ambassador to Denmark.